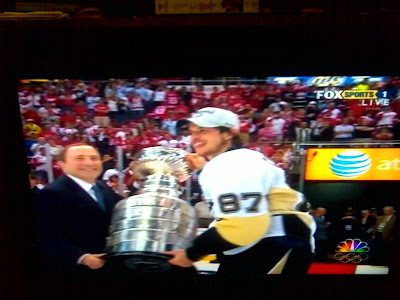 wdnicolson.com - An NRL Blog: PENGUINS WIN STANLEY CUP! 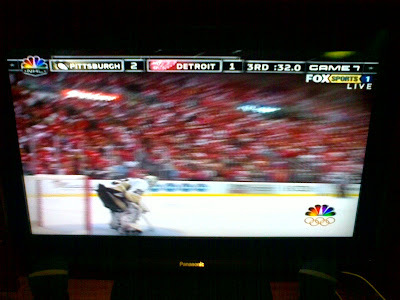 Thanks to a last second diving save from Pittsburgh's goaltender Marc-Andre Fleury on Detroit captain Nicklas Lidstrom - the Pittsburgh Penguins have won the 2008/2009 STANLEY CUP CHAMPIONSHIP! I haven't written a single blog on the NHL Playoffs this season because I didn't want to jinx my team the Penguins. Wasn't even tempted to do a Stanley Cup Final Preview because after being handled by the Detroit Red Wings in last year's Finals (Detroit won 4 games to 2) I wasn't confident the Penguins could turn it all around and stop the Red Wings from repeating. But stopped them they did. 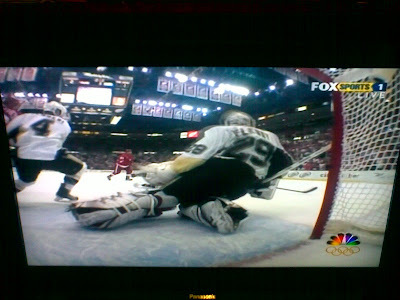 Fleury was magnificent in Game 6 and particularly Game 7 - stopping the Red Wings when they had to be stopped and pulling off two saves in the final 5 seconds - including the incredible diving to his right save on Lidstrom who had Overtime on the end of his stick. It was a fairytale finish and the Penguins - who rebounded from being humbled 5-0 in Deroit in Game 5 - deserved to win the Stanley Cup because they effectively won 4 of the last 5 games - including the final match in Detroit. 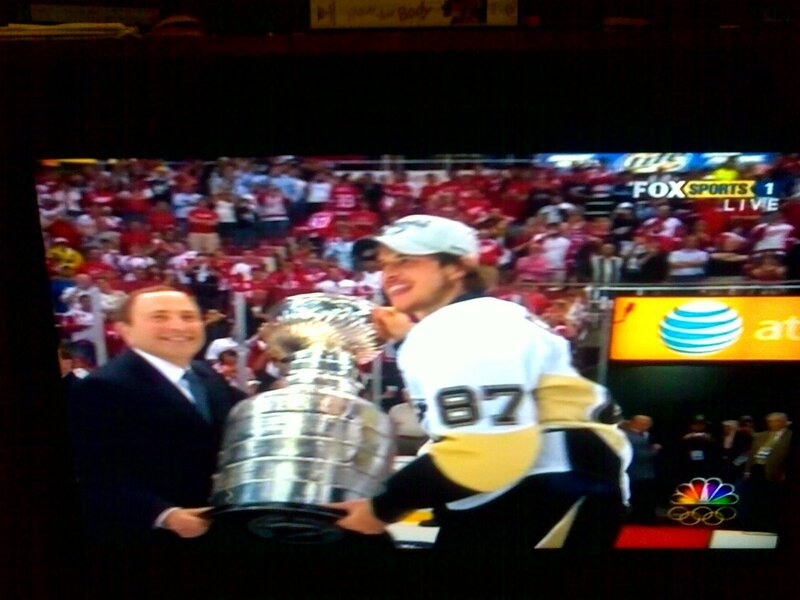 Evgeni Malkin won the Conn Smythe Trophy as Playoff MVP - well deserved - and along with Max Talbot (two goals in Game 7!) and Jordan Staal carried the Penguins in the last period of the game as captain Sidney Crosby was a passenger with a knee injury suffered midway through the second period. - I am stoked and although the pictures attached to the blog today are direct phone camera efforts from the HD Tv - they are fresh! 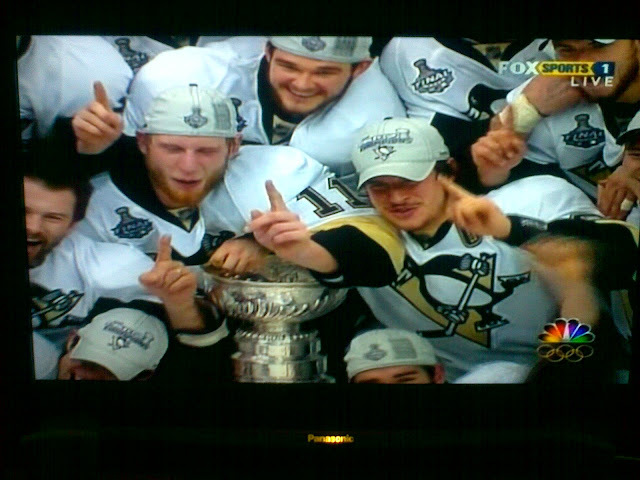 THE PITTSBURGH PENGUINS ARE STANLEY CUP CHAMPIONS! The last minute or two felt like an eternity, but the man above - Marc-Andre Fleury stood tall and won the Stanley Cup for the Penguins!